Space shooters, especially ones with grind, crafting and upgrade elements to them, are in no short supply these days. However, thanks to a successful Kickstarter campaign for the project, Rockfish Games, responsible for the mobile game series Galaxy on Fire, has created something more arcade focused and 'non-linear,' as they put it. Featuring intense high-fidelity space battles, a progressive 'cash-out' ship upgrade system, sector-based level design, and plenty of incredible galactic vistas, Everspace looks to find a unique pocket of space to occupy. There's something intrinsically arcade-like about Everspace. Being reduced to space rubble happens so frequently that veteran pilots will often being able to tell when their demise is nigh. By that stage, the feeling in the pit of the stomach, as it dawns on one that they've attracted the attention of too many enemies, will be commonplace to say the least. 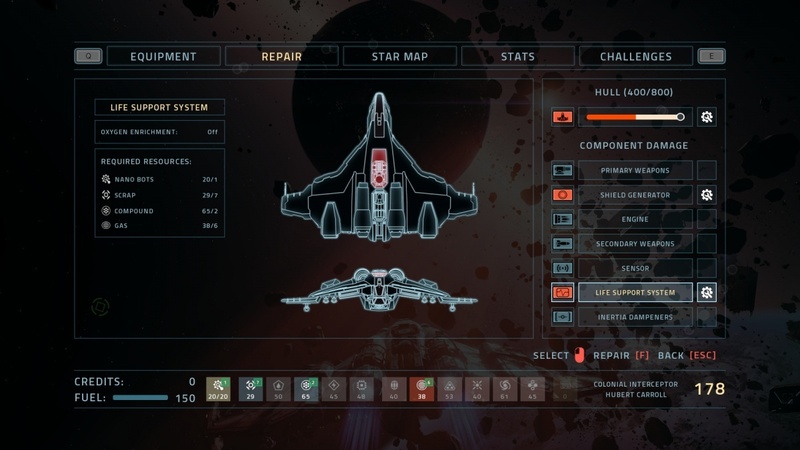 However, whereas many hard-edged games of this nature might plonk the player back at sector one and basically say come back with more talent, here, death simply signals the end of a satisfying run, and that it's time to spend the credits earned during the session on ship upgrades that remain forever intact. While this is a simple premise, it does wonders for the game, especially considering its short-burst form, with a good 'run' usually lasting somewhere in the region of twenty to forty minutes. This incremental sense of progress, owing to the permanent upgrades, also plays well in the design of this space shooter. Rather than the famous or infamous likes of Star Citizen or No Man's Sky, Everspace's doesn't quite have an open-word ethos. For one thing, there are plenty of elements you'll be able to see, but not reach, such as planets, which form part of the hugely impressive vistas. The more important aspect, however, is its quite modular and narrow level structure, which puts it more in line with Faster Than Light and Rogue Legacy. The game is divided into sectors, essentially a series of small-scale areas to clear, each with different hazards to avoid, enemies to outwit and materials to mine. While there's an element of choice involved here, these segments tend to present things to do quite rapidly, given that you can't stray away much in these environments, especially as you're being chased and hence have a limited time in each area. As such, it's never really a case of finding things to do, so much as simply managing the task at hand without meeting an untimely demise. Different sector routes are possible, and should the pilot have the required fuel, it's also possible to jump onto the next sector without really getting stuck into a particular area, which can be useful for bypassing potentially difficult situations when resources are thin. This modular approach to levels or 'sectors' might seem a little simple in some ways, but it adds to the strength of the overall gameplay ethos. This is because while initially it's quite difficult to progress pass the first few sectors, once the ship modifications start to take form, it becomes easier to cut down deeper into the more challenging sectors, where there are scarier unknown foes like you'd find in the deep ocean. The result is an experience with weight, as a run has value and so each one feels purposeful despite elements of repetition. Like a Klingon, this means there's a degree of satisfaction and honour to death, since at least in passing pilots get to spend their credits on new upgrades to ensure that they'll fair better next time. There's also a story surrounding this premise to do with clones, which fits around the gameplay quite neatly due to its balanced mix of exposition in cut-scenes and pilot reflection that occurs as gamers go about their grind. There definitely is a grind element to Everspace, as well - perhaps a slightly too stiff one for many gamers' tastes, but maybe that's more to do with the expectation that space games will be open-world, leisurely affairs, which can't be interrupted by the cold hard reality of space. This experience is far more determined to teach lessons the harsh way. For example, there's one enemy that pilots will discover later on who generates a black hole upon death, but this can only be learnt by going through the motions. While it was a bit of a slap in the face to be on the verge of glory, only for an effective martyrdom situation to play out instead, this also sums up the title aptly. No foe will do you any favours, particularly some of the larger beasts found in later sectors. Knowing their weaknesses and taking note of previous encounters is key. Likewise, there are plenty of environmental hazards to factor in, such as lightning storms, as well as more survivalist elements to account for, like having the fuel to make the next jump or the nano-bots to scrape that vital shield repair job. A tactical approach to every aspect of the game is certainly sensible, but beyond that there's also a palpable sense of discovery as one figures out the kinks of each adversary and environment. This is something, ironically, that larger space-based adventures fail to conjure, largely due to the large-scale randomisation taking place in such titles as No Man's Sky. This is not to say, however, that each run isn't met with a fair degree of unpredictability and randomly generated elements (or so it seems), though a lot of the items that pilots will acquire are staples of the general grind process, such as mining scrap, crystals and ore. Sometimes, on a whim, a downed enemy will drop something special, or you'll find something amongst the rubble of a dilapidated old ship ruins that changes the entire outlook of the run considerably in your favour. Or maybe you'll want to conserve that item for a later time. In the tactical sense, these moments provide plenty of choice, and prove to be some of the best moments of the title overall. Game-changers range from powerful weapons to ship modifications that amp up certain abilities, or blueprints for ship components, as well as consumables that can often provide the oomph for the pivotal moment. These elements often prove to shape the session, should one be intrigued enough by the newly-found item to deviate from their original goal. This is a nice aspect of Everspace that ensures a degree of freshness despite the slogs that hooked players will likely log. Just like other grind-intensive shooters, such as Borderlands or Destiny, although the progress feels a tad on the slow and frugal side, the credit and upgrade rewards certainly incentivise the cycle very well. This also means, however, that the game is vulnerable to some of the typical grievances from those series. For one thing, although the areas within each sector seem to be randomly generated to some degree, there isn't a huge amount of variety of tasks to undertake, particularly during the initial three to four sectors. This seems quite glaring, especially given the fragmented approach to level design, which really highlights this lack in variation. It does seem like a slightly missed opportunity for Everspace, given that the previously-mentioned 'modular' design should surely give the developers the opportunity to create plenty of playful and creative one-off scenarios, although not necessarily as extreme as something in the creative vein of Super Mario Galaxy, which takes a different approach with each stage. Instead there's a little too much reliance on mechanical generation to really provide a sense of singular spontaneous events. The result, however, while formulaic, still feels distinctly gratifying. This is mostly down to the fact that the space battles feel so great. The combat is fluid, fast-paced and very intense, whether playing in third-person or the more realistic and intense first-person view. As recommend, the keyboard controls really are the way to go, since Rockfish Games did such a good job designing an intuitive interface in that regard. Although there's an initial jarring sense of difficulty getting your first ship under control, it won't be long before you're powering through everything with the thrusters on. Weaving around a congested battle zone whilst homing in on a combat target feels incredibly intuitive once the player gets the hang of it. Everything is extremely well-mapped. In addition, combat exchanges become even more addictive as pilots begin to understand and experiment with how different primary and secondary weapons can affect the attack strategy when combined with how players move and use the environment to their advantage. Perhaps a plasma primary to down the shield quickly, followed by the gattling gun secondary to efficiently splinter the foe once in the appropriate range? It's all a matter of taste, and experimenting is a significant part of the fun, too. All these aspects pull together nicely as the credits roll in and the ship components multiply. Though it requires some dedication, it's an empowering journey going from rookie rogue to a self-empowered juggernaut. Everspace is also tremendously visceral and arguably delivers the most high-fidelity space visuals you're going to find out there today. With the graphics settings maxed out, it not only looks extremely pretty, but feels about as cutting edge as it gets. The space vistas that pilots are regularly treated to also rank among some of the most epic out there, making it very difficult not to take a screenshot when a pilot approaches a scene in just the right light. It's just a shame you can't poke your nose around the side of that planet, or past that asteroid belt. Again, this is the downside of partitioning the action, since although these are meant to feel like intriguing areas of huge sprawling sectors, often they seem a little too repetitive and formulaic. With that said, it's fair to say the overall balance is very impressive and this recycling doesn't damage the game experience too much, since the drive to venture deeper revolves more centrally around upgrading the ship and its gear. There is a choice of light, medium and heavy ship type, which opens more possibilities for longevity, but once you've sunk some credits into one, it's hard to walk away from that one. There are so many smaller increments to work on upgrading within each ship that moving between one halfway through the experience would seems a little wasteful. Still, it's nice that there is a choice in there, which is available from the start - although there certainly was potential for a much more diverse range of ships with more special emphasis and distinct abilities. In this sense, perhaps this title hasn't quite grown out of its Early Access form, although in every other respect, it's one of the most polished sci-fi games in recent memory. The audio is very crisp, with voice acting quite impressive despite the protagonist's somewhat underwhelming personality. The music that drifts in and out accentuates each situation very well, with a range of surging rhythmic textures, drone sounds and synth elements, as well as distorted guitar and other sci-fi suitable tones. While it's not particularly memorable, it certainly does seem to be tastefully composed and always helps to intensify the given moment. In most senses, then, Everspace is quite an audio-visual treat, as well just as an excellent arcade 3D space shooter. While it's not perfect, suffering from a lack of design variance in some ways, it should be admired for committing to a fragmented sector structure, which does ensure every play session is fluid and action-packed. Perhaps there might have been a way to open up the stars, and feature a more expansive open-world environment. 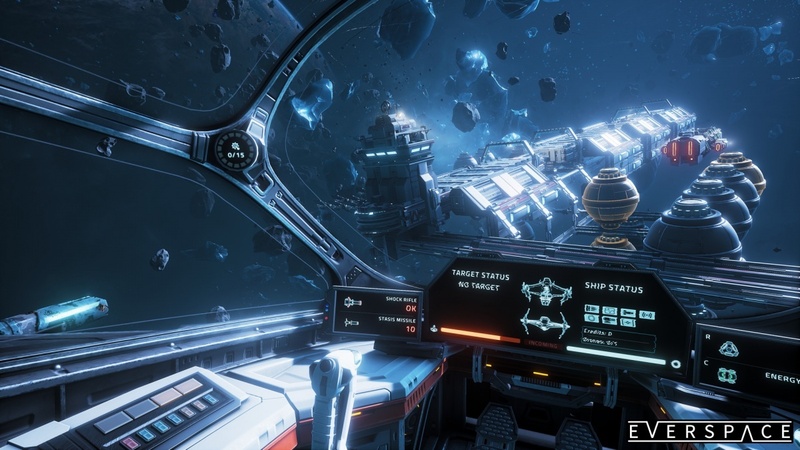 However, that would likely detract from the game's many modular strengths in terms of gameplay and design, which ultimately form the most addictive aspect of Everspace, so while some may be deterred by the game's quirks and sharp learning curve, in arcade terms, this is more than a just rough diamond. It’s an addictive and fun sci-fi game to truly get lost in.